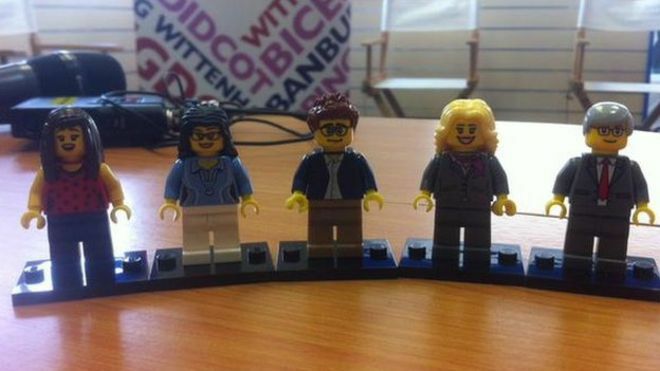 The Oxford West and Abingdon hopefuls recreated in Lego for BBC Radio Oxford by Andrew Beaumont. #GE2015 is the ‘is it a social media election?’ election. Most usually the question has been asked only to be rejected, with the Guardian arguing midway through the campaign that it was already ‘the social media election that never was’. Others have asked ‘will the internet – or the press – swing the election?. But are these really the most interesting questions that we can ask about social media and elections? More interesting is why the election debate has mentioned social media, the internet and digital technology so little? The myriad of issues that political leaders might have emphasized – broadband, digital exclusion, open government, digital democratic reform, internet regulation, cybersecurity, government surveillance of social media data, digital public services, internet innovation – featured little in debates, speeches, national campaigns or party manifestos. The leadership debate of early April didn’t feature digital technology at all, as the Guardian noted. And although the Conservatives placed more emphasis on such issues than Labour, and the Lib Dems made a feature of digital inclusion, no parties really mainstreamed these issues in their manifestos. As Martha Lane Fox put it after her impassioned Dimbleby lecture calling for attention to internet issues, ‘not enough MPs and journos are talking digital in this election but it’s fundamental’. Another interesting question is why UK elections don’t feature YouTube? #GE2015 certainly hasn’t been a YouTube election, as the 2008 US presidential election has often been described. The total number of YouTube views of political video clips, even including those of mainstream media such as the Leaders’ debates would fit into a tiny corner channel of the US election in 2008 or 2012. Cassetteboy’s rap of Cameron and Farage got over 1 million views Even by far and away the best of political election broadcasts or advertisements of the campaign, the Green Party’s ‘Change the Tune’ Boyband, is still looking for a million. In the US in 2012 the Obama versus Mitt rap battle video received 100 million views. It is the case that the parties have engaged with other social media like never before. Of course, it is not surprising when the Conservatives are being advised by Obama’s 2012 campaign manager, and Labour by his communications expert. The Conservatives spent 10 times more than Labour on Facebook advertising (£110K a month) and there are signs that it has paid off, with more likes (over 423K) and shares than any of the other parties. However, a Guardian summary half way through the campaign found that on social media overall, Labour was winning the battle so far, with more than 1.5 million mentions compared to 902K for UKIP and 855K for the Conservatives, a ranking replicated on attention to their Twitter account. And Labour is the only party to own an Instagram account. However, the parties have run somewhat sterile, highly managed campaigns on social media, as they have in mainstream media. Cameron, with nearly a million Twitter followers has used both Twitter and Facebook mainly to document his campaign, or distribute negative advertisements. Only Nicola Sturgeon has managed to come anywhere near delivering the personal touch which Obama achieved so successfully. There has been nothing like Obama’s use of channels like Instagram, Buzzfeed and Reddit to reach out to younger people– and without the US president’s reach across channels, Cameron’s one interview on Buzzfeed had little resonance. More interesting is where rapid bursts of social media activity have pierced the tightly controlled (and some say, tedious) nature of the campaign, from the 100K Twitter storm of the last Saturday night before the election (#VoteCameronOut) to the surprise emergence of Miliband as a teenage idol (#Milifandom). As in so many other contexts outside election time, real-time social information about what other people are thinking or doing has fuelled political mobilization. When the party leaders have slipped up, as when Cameron described the election as ‘career-defining’ instead of ‘country-defining’ or Ed Miliband created an 8ft stone with engraved pledges to the nation, widely regarded as a mistake reminiscent of Neil Kinnock’s victory rally in Sheffield in 1992, social media were quickly ablaze with recriminations. And these events have been particularly interesting when as Buzzfeed’s Editor-in-Chief put it, Britain’s 2015 Election Pits Newspapers Against the Web. Murdoch’s ruthless attacks on Miliband through The Times and the Sun throughout the campaign have been met with a remarkably coherent intervention by the 17 year old instigator of #Milifandom (tweeting as @twcuddleston) after she and her grandmother were doorstepped by Sun journalists and she inquired how they got hold of her address: ‘@rupertmurdoch Can you please explain to me how within 24 hours of #milifandom I had your reporters knocking on mine + my grandma’s door?’ By May 3rd she had 25 K followers (five times as many as the Sun’s election account) and mass support across social media, including much pressure on Miliband to make contact, which he did. The Conservative ex-MP Louise Mensch weighed in with criticism of press-seeking, although one tweet counselling her: ‘Bit of advice love, I REALLY wouldn’t go after a very popular 17-year-old. Makes you look mean, nasty and bitter’ was retweeted 110K times on May 2nd, as were other hostile interventions by Sun journalists. However, rather than a fight in the heat of the election (as often portrayed), these events highlight an ever more intricate, co-dependent and troubled long-term relationship between the mainstream and social media. On the one hand, for many years traditional news outlets have felt threatened by social media and the internet. At the same time, they are increasingly dependent for their audience on social media, where their potential readers spend so much of their time. Indeed, as newspapers cut back on reporting and research, social media often provide the story, or provide the political parties with an outlet for publicity. Ed Miliband was widely mocked in the mainstream press for being the only party leader to give an interview with Russell Brand, while Twitter resonated to #milibrand. But Brand has 10 million, mostly young followers on Twitter, and he has long been recommending them not to vote, so it is hard to see how turning down the opportunity would have been good strategy. The interview accumulated over a million views on YouTube in under a week (although Brand’s eventual endorsement of Labour might have had more effect if it had been made before the deadline for registering to vote). Young people aged between 18-24 rely almost totally on online news sources for information on policies and 59% rely on social media for the opinions of others. Yet there is heavy reliance of social media on traditional media. Twitter for example would be in a sorry state if there were no print press and TV stories to endorse, share, and to attack. Much political content on Facebook derives from mainstream media sites. The leadership debates and interviews on TV generated huge participation on social media, with 1.5 million tweets for the first leadership debate. So social media and mainstream media have a complex long-term relationship based on mutual need. A bit like a coalition. And as with whatever coalition eventually emerges, it will be some time before we can judge the role of social media in this election. Indeed, with the two largest parties’ national voteshare flatlining in the polls throughout, it is hard to assess what difference any of the national campaign has made. The vagaries of the broken first-past-the-post electoral system, with widespread tactical voting and an overweening focus on marginal seats have rendered the final tally in either seats or votes impossible to call, even by the US data science guru Nate Silver. Social media do not appear to have facilitated any party in making a major breakthrough in vote share, or to have allowed them to overcome the ‘prisoner’s dilemmas’ inherent in cross-constituency tactical voting agreements. The #VoteCameronOut initiative would have been an obvious place to implement such arrangements but made no mention of tactical voting, and the various sites geared at vote swapping have not gained traction. So only after the election will we be able to determine the difference, if any, that social media made to the result. At the Oxford Internet Institute (University of Oxford) we are collecting a comprehensive dataset from across platforms and will endeavor to make that call. It is likely that the analysis will only make sense at the constituency level, where candidates’ social media campaigns have played out, with Twitter (for example) providing tools that allow the parties to target local voters, and we have started to look at this here. The total numbers in the national campaign may well turnout to be meaningless. But (for example) aggregate analysis of all the local social media campaigns and their relationship with change in vote share and turnout after the election may provide real insight into the nature of contemporary elections and voting. So there are much more interesting and important questions to ask of social media and its long-term relationship with politics and the media than ‘is this a social media election’? The mainstream media and opinion polls focus their political attention on major institutional events – elections – and they provide blunt instruments to understand citizens’ democratic experience in the intervening years. The kind of data we can collect from social media on an ongoing basis, at local as well as national level, can reveal underlying patterns and trends in political behaviour, preferences and discourse throughout the term of a parliament. They can show which policy issues people think are important and how civic engagement and mobilization can succeed – and fail. We should make use of such data to develop long-running indicators of how people experience and interact with local and national political representatives, public services, media organizations and democratic institutions (such as legislatures and electoral systems), and use them to improve the quality of our democracy. Note: This post gives the views of the author(s), and not necessarily the position of the Oxford Internet Institute.